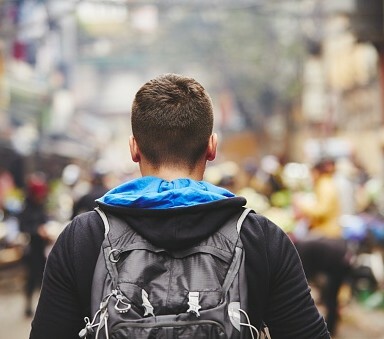 As we introverts know, being an introverted traveler doesn’t mean we are necessarily shy; but it does mean that we travel differently than our more extroverted counterparts. In fact, many people don’t even realize they are introverts; most people fall somewhere on a spectrum, so some people consider themselves “ambiverts,” “extroverted introverts,” or “social introverts”. The main difference between introverts and extroverts is from where we recharge our batteries and gain energy. Extroverts get their energy from outside stimuli and through interactions with other people. But we introverts are more introspective, needing to re-charge our internal batteries through alone time. Rather than small conversation with anyone and everyone, introverts tend to prefer quality time in more intimate settings with fewer people. You probably never leave home without your headphones anyway, but a good pair of noise-canceling headphones does wonders to drown out crying babies or simply to focus on your favorite music, podcast, or audiobook. Plus, having a sleeping mask, book, or e-reader are excellent ways to subtly tell the world: Do Not Disturb. Your travel should be a time for you to indulge a bit. You’re likely taking time off from work, spending your hard-earned travel money, and you don’t have to worry about the “real world schedule.” You’ve earned the opportunity to excuse yourself from social interaction. We know that being introverted doesn’t mean we are necessarily shy. Part of the joy of travel is experiencing it with someone else. It could be your spouse, a favorite travel buddy, or even a fellow traveler in a small group. Travel bonds people and it’s not uncommon to build lifelong friendships with people you meet along the way. If you find yourself being a bit too hermit-like, challenge yourself to be more social than you normally would. Invite a traveler in your group to join you for dinner or share a snack and chug of water with a fellow hiker. One of the best ways to experience nature is to be an active participant in it! Getting outside and moving your body is an excellent way to get out of your own head and experience the world in which we live. So many people never leave the confines of the city, even though Mother Nature has so many things she wants to share with us. This is where introverts should fully embrace their introversion and spend some time alone. It’s totally okay to want to embrace the solitude. Read a book, sleep in, have a dance party of one, or just spend some time journaling: these are things we all do, but some things are just left for our own privacy. Solo travelers will usually pay a single supplement for their own room. Pro tip: as an alternative, consider finding a roommate in your small group and upgrading to a suite! It is often possible that you may spend less, per person, in a fabulous suite than having your own room in a more basic category. Many people daydream of being a travel photographer for National Geographic. When you’re out traveling, channel your inner-NatGeo photographer. You can actually take some great photography with an iPhone, but you may want to consider investing in a higher-quality DSLR or getting a fish’s perspective with your GoPro. For us introverts, photography is also a good way for us to politely excuse ourselves to seek out a shot. And when we are traveling in small groups, it’s also great to snap some shots of your fellow travelers, both posed and candid (without being creepy, of course). The favor will surely be returned and it’s a great way to get shots of yourself (hello, Instagram!). Downtime is essential in re-charging our batteries. Travel can be sensory overload, so it’s easy for our batteries to drain quickly (but a deep rest after a great day of hiking is one of life’s simple pleasures). Schedule this downtime into your day when you’re traveling. You can do it in lots of ways; wake up an hour earlier to do some yoga, enjoy a tea and some writing after lunch, or head back early to read a bit before bed. If you’re traveling in a small group, it’s okay to not participate in every available group activity. There are obviously certain experiences along the way that you’ve specifically traveled to see, but it’s fine to order room service or to sit-out a short afternoon hike. Travel elicits emotions that we don’t normally feel every day, ranging from excitement, nervousness, gratitude, and awe. Writing down these feelings and recounting these experiences is cathartic and is a good medium for introverts to channel our thoughts and feelings. Use your travel time to untether yourself from technology. There’s nothing wrong with uploading photos to Instagram when you get back to your room or posting a quick status update, but don’t get lost in a Facebook click-hole or listen to music the whole time. It’s amazing how loud (or deafeningly quiet) nature can be. Do not go full steam ahead into the Real World! Take a day to catch up on sleep if you had a long flight and to allow yourself to process the life-changing experience you just had. You can use the extra day to ease back into your everyday life again, like stocking up on fresh groceries (but order takeout that night, don’t feel obligated to cook). You can also take the extra day to unpack and do laundry. Approach travel with a completely open mind, with intentions rather than expectations. There’s no specific way your travel experience needs to look. Don’t worry about taking the most envy-worthy Instagram photos or having a long list of wild stories. Enjoy your own company. Grow. Be Yourself. It’s totally okay to come back home with nothing more than a few photos, a clear mind, and a full soul. Inspired by a solo hiking trip in southern Utah, Jacob left a career in finance to pursue a life of travel, adventure, and nature. As Founder and Chief Explorer of IntroverTravels, he builds his online travel agency remotely from unique, off-the-beaten-path locations around the globe, and uses that experience to help plan life-changing travel experiences for fellow Travel Nerds.